Guaranteed car loans are usually available through dealer financing companies or online lenders. These loans may be called "instant" loans or "pre-approved" loans, but each term generally means you only need to meet minimum requirements to have an immediate loan. While the convenience is valuable for most consumers, borrowers should be wary of hidden fees. Your annual percentage rate (APR) will be higher if you do not negotiate the loan. This is especially true for bad credit borrowers. Bad credit borrowers often look to guaranteed loans because they cannot find traditional financing at a bank. However, when a guaranteed lender takes on your high risk loan, the lender will charge you astronomical, and often adjustable, fees. Beyond interest rates, there are a number of hidden costs in guaranteed car lending. The most notable is high prepayment fees. Because the lenders know this is a high interest rate, the lender is very aware that many borrowers may attempt to refinance or pay the loan off early in the future. 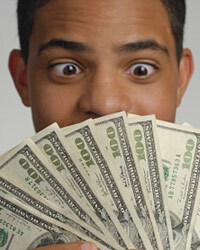 To protect against this, the lender will assess large fees if you attempt to modify the loan. The lender may also charge a large fee if you are late on a payment.